The entrance opens into the elegant sitting room leading on to its own balcony with a spectacular view of Caprese Michelangelo. Outside: The balcony has a wrought iron dining table and chairs and is lit in the evenings. The Kitchen is fully equipped with a cooker, fridge, sink and utensils. There is a dining area with a large marble dining table. The villa has a super king size bed with a sumptuous mattress for a great nights sleep in the large bedroom with en-suite shower room, bidet and toilet. This beautiful villa has its own private garden with picnic table and fruit trees, and is the perfect honeymoon villa. Beautiful Tuscan villa for couples, no children allowed. Right in the heart of Tuscany overlooking the village of Caprese Michelangelo and is set in 100 acres of the most beautiful mountain forests. 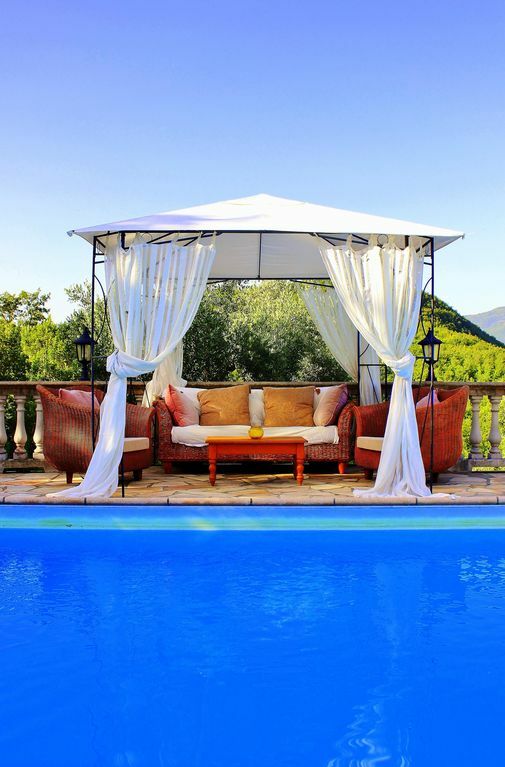 The relaxing, heated salt water pool complete with Roman steps, sits in a peaceful olive grove with a breath-taking view through the mountains to the fairytale-esque Castle of Michelangelo. If you can’t find the dates you need please contact us as we have another 3 villas here. The tranquil position, frequently described as 'paradise on earth' contains an abundance of wildlife where the birds sing all night and the fireflies provide a moving display of sparkling light. In years gone by, the villa was owned by the Vatican and was used to house monks from the monastery. Ideal for walking and cycling, the area is home to many fine restaurants, with truffles and mushrooms being a local specialty, and good Tuscan wines. The mountains and forests have inspired the three greatest artists of the Renaissance and remain largely unspoiled today. This is where the great artist Michelangelo was born and lived. The little chapel where he was baptised is in the village and a museum dedicated to him is within the Castle of Michelangelo. Nearby at La Verna is the Franciscan monastery retreat where St Francis of Assisi is said to have received the stigmata. Rich in Renaissance history are the local towns of Sansepolcro, Cortona and the medieval walled town of Anghiari. It is ideal for walking and cycling in particular. There is so much to see & do as well as time to relax by the salt water pool which is heated by solar panels and it gets very warm. So plenty of sun cream is very important especially as we are in the Apennine Mountains and at 600 metres above sea level the sun's rays are very strong. The area has many great restaurants and because we are not close to the city the prices are very low. We have a taxi service available to take guests to any of the wonderful restaurants nearby. Anghiari, a wonderful medieval walled town is nearby. In Caprese Michelangelo you will find the castle and birthplace of the legendary artist Michelangelo to visit, as well as a lovely family restaurant called the Buca di Michelangelo,where it is possible to have a 4 course meal that is around 25 euro a head and it is amazing! You can have truffles on your pasta which is incredible. Look for anything with Tartufi. So the pasta con Tartufi or Gnocchi con Tartufi which means with truffles There is a Pizzeria called Il Boschetto and If you eat there at the weekend you can then get a free pass to the dancing outside. Enjoy an authentic Italian experience at the local olive oil mill. The mill dates back to 1421 and is still in use to this day. This wonderful experience of visiting an oil mill is fantastic. First you will have a little tour of the mill and then you go to the family residence where you will enjoy a fresh and delicious meal complete with wine made from the grapes from their own vineyard in the courtyard. This is preceded by an opportunity to taste the many variations on their own oils. Particularly remarked upon, are the fennel, lemon, black and white truffle and basil flavoured oils. Located in a picturesque alpine valley town nearby is the thermal spa which offers guests the perfect setting to relax and unwind. The large pool is separated into indoor and outdoor sections, enabling visitors to take in the breath-taking views or gaze up into the night sky. This beautiful spa also boasts Jacuzzis, waterfalls and a steam cave. The ancients considered the thermal waters to come from the gods, a precious health-giving gift from the mysterious depths of the earth. Today, geologists can explain that the gift is not actually heaven-sent, but a little "miracle" of nature. The warm waters are in fact rain that fell some 10,000 years ago in the central part of the Tuscan-Romagna Apennines. During these millennia, the water seeped down into the subsoil and was heated geothermically and enriched with beneficial properties. The water became a concentrate of active natural elements including sulphur, bicarbonate, sodium, potassium, calcium, magnesium, fluorine, chlorine, lithium, manganese, iron and ammonium. It then rose towards the surface along a fault line until it reached Bagno di Romagna where it now flows at temperatures between 39 °C and 47 °C. The water that now flows out is physiological because it contains active elements that correspond to those of the human body. It is also medicinal and can therefore change and positively influence the conditions of the human body. It is easily tolerated because it has none of the side effects of drugs. Finally, the water at the thermal spa can be used to treat certain diseases and, above all, to prevent them, because it activates the body's natural defenses. You don’t need to worry about bringing shampoo, hair conditioner or shower gel as we supply all of that. We also supply all the towels including pool towels. I was lucky enough to have come house hunting at the right time when this property had not yet been advertised and as soon as I saw the view I knew that nothing else would compare. The entrance opens into the elegant sitting room leading on to its own balcony with a spectacular view of Caprese Michelangelo. Contains sofa & armchairs. The balcony has a wrought iron dining table and chairs and is lit in the evenings. Kitchen is fully equipped with a cooker, fridge, sink and utensils. There is a dining area with a large marble dining table. The pool is heated by solar panels and is salt water. Notes on accommodation: This villa is a fantastic romantic honeymoon location. There are 4 exclusive villas set in 100 acres of mountain forests. Each villa has its own private garden and terrace with full WiFi internet access. The pool is shared by the 4 villas. Outside: Beautiful large heated salt water swimming pool with descending Roman steps. Barbecue and comfy patio seating and swing chair and swing sun loungers. Private garden. Guests can walk in our forest and visit the waterfall and etruscan tomb on our land. The main courtyard iswhere you can enjoy a meal or drink and in the softly lit gazebos. Cleaning / Towels / Linen / Maid service: Linen change weekly. A complimentary welcome basket of groceries for your arrival. Other: This beautiful villa has been lovingly and elegantly restored using chestnut beams, terracotta tiles and local stone. The walls have been decorated with oil paintings and tapestries which contain fine views of Italy. Fantastic holiday gorgeous surroundings so happy! Fantastic place to stay - where shall I start - rooms were ready as soon as we arrived although they are not normally ready in Italy till 4pm - well the rooms are fantastic - very big indeed - fully equipped with everything you would need for self catering. Staff were all amazingly friendly , always happy to see you and chatty to the kids. The pool was lovely, really clean, big warm and not too deep as i'm not a great swimmer which was nice. Food -It Was the best food I have ever had! The local restaurants were a 5 min drive and drop dead gorgeous- there was plenty to choose from and I ate more than I needed every day! - we were a party of 8 including my grandparents of 79 and 76 and they ate every day ( like old people we afraid to try some things avoiding truffles ect but they still enjoyed the food. My wife and father in law would have preferred more spicy food but that is down to personal choice. They asked for suggestions for meal times - I suggest perhaps having a joint of meat available ( pork beef ect for a safe option for people less keep on trying new food - as for the rest of the week that's exactly what happened - now you don't get that happen in many places !!! Location - A short drive from the airport very easy to find a tiny airport never got out and through so fast! The drive itself took about 45 mins and was like something from a film with the views that you all dream of when you think Tuscany. Finally we have just returned from a mini heat wave - September was supposed to be 25 or 26 degrees - well on wed of last week is was 38 degrees and even as a sun worshiper I couldn't come out from my umbrella - fantastic holiday and we have met some really nice people will 100% come again! Breathtaking views all the way to the villa ! On arrival it was equally beautiful , amazing villas , pool and the views adorable ! The host Freya and her work team are absolutely amazing pampered to your every needs and full of great information on places to visit and eat ! Will definitely be making the visit again I literally can not wait ! Beautiful villa with stunning mountain views. Beautiful villa with spectacular views . This place is so relaxing with salt water pool & shaded reading area. The villa was very clean & well looked after with a basket full of products. The owners are so helpful with local knowledge of walls & places to eat . I would certainly recommend this place to friends & family in fact I already have. The villa was of unequaled quality and service with a view that is second to none we also opted to eat at the villa a few times the authentic Tuscan cuisine was outstanding i recommend this option you are central to some of the worlds most stunning and historical places imaginable the surreal feeling of standing in places like the castle Michelangelo was born in and the monastery of saint Francis has to be experienced at least once in your life and this is the perfect place to do that theirs not enough space to tell you every thing but its a must you will not regret it . Myself and my husband stayed in the Michelangelo this year and had a fabulous holiday . The villa was clean , beautifully furnished and well equipped including a large comfortable king size bed. The kitchen was perfect for the two of us do some meals ourselves but we also ate out a lot as the area has so so many fabulousness places to eat ! The views from the villa are breathtaking and it’s an amazing place to wake up and look out from . The pool was very peaceful and idyllic , perfect for some lazy afternoons or morning swims . We had dinner made for us by the hosts on the first night and this was delicious and saved us rushing back out after arriving late . There are so many amazing places to visit in the local area we plan to go back next year with some friends . The hosts were very accommodating and knowledgeable about the local area , definitely do the olive mill tour that was a real highlight ! We had an amazing holiday and can’t wait to go back ! Adriatic coast is only 50 min away and the wonderful port of Cesenatico is a great place to visit with its harbour full of boats and restaurants. Glorious beaches of golden sand. Easy access from most UK airports and only 45 min drive from Perugia Airport via Ryanair from London Stansted. Bologna and Pisa via British Airways or Ryanair 2 hours. The beautiful village of Caprese Michelangelo is where the great artist Michelangelo Buonarotti was born in 1475 and lived. The little chapel where he was baptised is still in the village and his home is now a museum which is set in the hilltop fortification of old Caprese, the castle of Michelangelo. In the local Abbey there are historical records which show that Villa Michelangelo was previously owned by the Vatican and housed monks for the monastery at La Verna which is approx 18 km away by road. It states that the monks built a tunnel between the Villa and the monastery and that a church once stood here also. Although we have not yet found the tunnel we hope that one day someone will find it. The area has many great local restaurants and supermarkets. A security deposit of 150 euro in cash is required to be paid at check in.